A vote for every man over the age of 21. Payment for MPs (so poor men could serve). The riots as such were an immediate failure due to numerous reasons, and the organisers were arrested and deported, most famously John Frost for whom the central square in Newport is named. However, all but the sixth were eventually obtained, rights that we now take as read that we have here in the UK. This has always been a vital, albeit neglected, part of Newport's history and the history of democracy, and it was commemorated by this mural for many years, giving locals the opportunity to explore a important piece of history. However, Newport Council, in all its wisdom, decided some time ago to demolish it in favour of a new shopping centre that will be ultimately built on the site. Cadw, Wales's heritage body, also did not see fit to try and preserve this important monument to history and art. A vociferous movement has been active in Newport to try and save it, planning a demonstration for this weekend, but Newport Council sneakily decided to jump the gun and in went the Council's contractors, who pulled it down this afternoon. 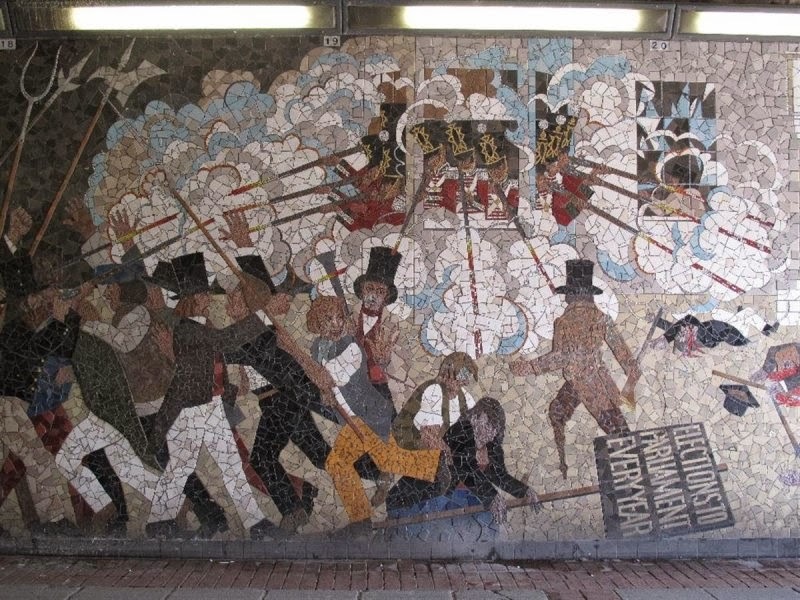 There have been numerous suggestions made to preserve this mural, and I am absolutely disgusted that none of them appear to have been pro-actively considered, preferring to rain destruction on a historical and artistic artefact. I have yet to hear (apart from one single, lone, dissenting voice who choses to label the Chartists as "terrorists") any opinion to the contrary that it should have been preserved. The decision makers at Newport Council clearly haven't been listening to the people who voted them in, the people they serve. It is worth noting that Newport Council were the bad guys in 1839 too, drafting in special constables and soldiers and arresting the leaders including John Frost, and many of the Chartists both before and especially after the Newport Rising. I have very little reason to go back to Newport, and with the city centre of Newport currently devoid of anything much worth visiting, this sly destruction of the heritage of the city by the Council does not seek to endear me much to even thinking of returning anytime soon.